The perfect place to start. A 5 minute video explaining the process of setting up an email account. A comprehensive article discussion E-Mail Account setup. 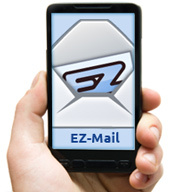 In this tutorial we show you how to find the needed information to setup EZ-Mail on your phone. Then we walk you through the steps of setup on an Iphone. A step-by-step tutorial for setting up EZ-NetTools email on your android phone. A new tutorial with the latest instructions for setting up an Android phone.